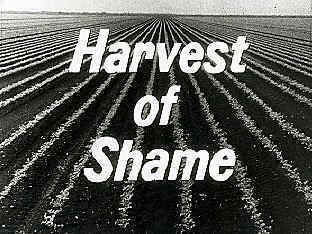 Harvest of Shame was a 1960 television documentary presented by broadcast journalist Edward R. Murrow on CBS that showed the plight of American migrant agricultural workers. It was Murrow's final documentary for the network; he left CBS at the end of January 1961, at President John F. Kennedy's request, to become head of the United States Information Agency. The program was an installment of the television documentary series CBS Reports, widely seen as the successor to Murrow's highly regarded 1951-58 CBS program, See It Now. Murrow's close associate, Fred W. Friendly, who co-produced See It Now, was the executive producer of CBS Reports. Their colleague, Edward P. Morgan, had taken up the issue of migrant labor in his CBS Radio Network commentaries. Morgan’s assistant had visited Senator Harry Byrd’s Northern Virginia farm during the apple harvest and was outraged by the conditions of the migrant laborers working there. According to Murrow biographer Joseph Persico, Friendly decided that the issue was a natural for Murrow, long seen as a champion of the oppressed. 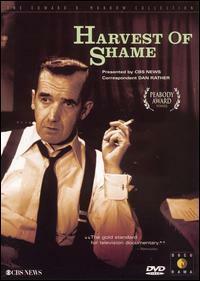 While Murrow and Friendly are often seen as the forces behind the show, broadcast historians such as the late Edward Bliss, Jr. have also given credit to "Harvest of Shame" producer/reporter David Lowe. Lowe did much of the legwork, including a number of the interviews featured on the installment. The program originally aired just after Thanksgiving Day in November 1960. The December 5, 1960 edition of Time quoted producer Lowe as saying, "We felt that by scheduling the program the day after Thanksgiving, we could stress the fact that much of the food cooked for Thanksgiving throughout the country was picked by migratory workers. We hoped that the pictures of how these people live and work would shock the consciousness of the nation."